We have been so busy that I resigned to the fact that we wouldn't be putting together a birthday celebration activity and blog post for Mike Curato, who we had the pleasure of meeting at the National Book Festival 2017. I did check out a stack of his books at the library and I thought reading Curato's Little Elliot books on the couch together with my youngest daughter would be our own little birthday celebration no one would ever know about. 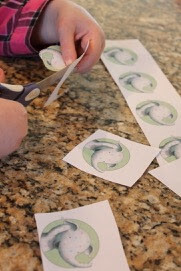 Little did I know that my daughter would make a few suggestions that would inspire an impromptu celebration we would be able share with you. 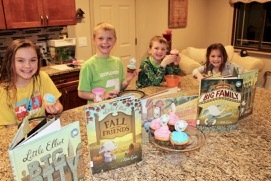 Mike Curato is the author and illustrator of Little Elliot, Fall Friends and Little Elliot, Big Fun. He also illustrated Worm Loves Worm, written by J.J. Austrian and All the Way to Havana, written by Margarita Engle. In an interview with Jena Benton he said, "I have been drawing since I can remember. It's always been a favorite thing." Mike studied illustration at Syracuse University and worked as a graphic designer before finding his way to picture books. His first endeavor was illustrating a self-published book for a local author. In an interview with Martha Brockenbrough Mike said, "The experience emboldened me." 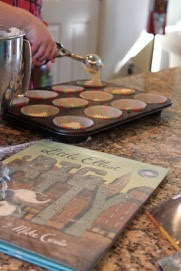 Then, he worked on his portfolio, refined his pencil+digital art style, developed a little elephant character that would later become Little Elliot, and after years of hard work he published, Little Elliot, Big City. My daughter chose to read Little Elliot, Big Family first when we sat down on the couch together. It was the only one of Mike's books that we hadn't read already. In this book, Little Elliot's friend Mouse is excited about his family reunion. Especially, his grandmother's cheese chowder. 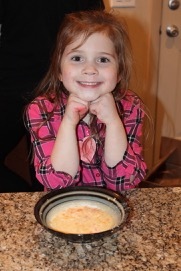 My daughter said, "Cheese chowder? That sounds good. Can we make that?" I think I responded with, "I don't know," and I continued to read. Sometimes my auditory processing is a little slow because a better response came after I finished the story. Little Elliot missed Mouse after he went away for the family reunion and then he was so happy when Mouse invited him to join his 147 cousins for the party. My better response after the book was "Cheese chowder? I wonder how you make cheese chowder." We looked up a recipe and realized we had all the ingredients in the house. At that moment we decided, "It will be cheese chowder for dinner!" 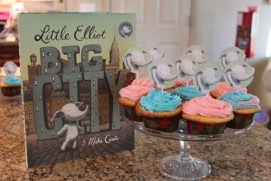 Next, we read Little Elliot, Big City In this story, Little Elliot feels small in the BIG city. He doesn't even get noticed when he tries to buy a cupcake at the bakery. Then, he meets Mouse and together they help each other. Elliot helps Mouse get a piece of cold pizza from a trash can and Mouse helps Elliot get that cupcake he always wanted. 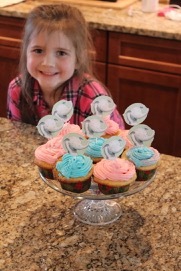 I figured since we were making cheese chowder we would need some cupcakes to go with it. 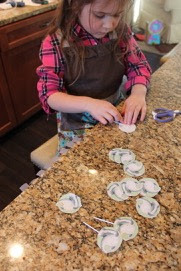 We set to work on the cupcakes first! 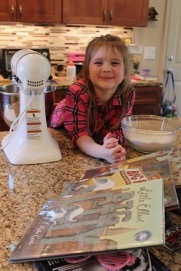 My reading (and baking) buddy. 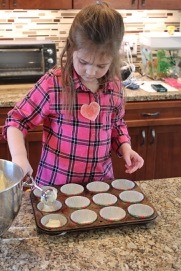 I was very impressed with how careful she was putting the batter into the cupcake liners. While the cupcakes baked we made Little Elliot cupcake toppers. We printed an image of Little Elliot from the internet and taped them to Halloween Ghost cupcake toppers that we found in the cupboard. 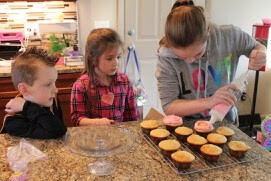 Big sister and big brother came home from school and wanted to help with the frosting. 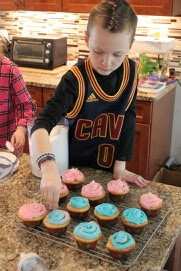 He sprinkled a little sugar on the cupcakes to make them glisten. 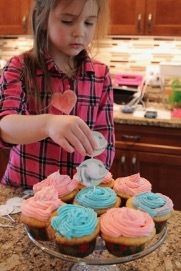 Pink and blue cupcakes just like Little Elliot's polka dots. Yummy! These would be the perfect snack for after dinner! "What's better than a cupcake? A friend to share it with!" But, that would have to wait until after the cheese chowder. 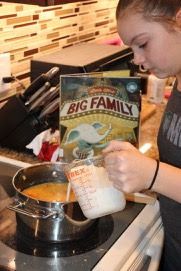 We used this recipe and the chowder turned out great! 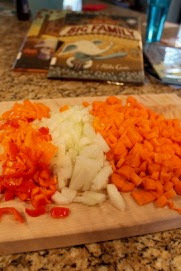 I love chopping the veggies! 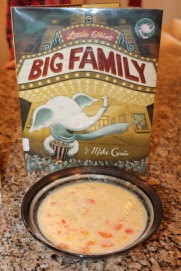 My oldest daughter and I made the cheese chowder while everyone else was at the park. It was delicious! Highly recommend the chowder and the book! 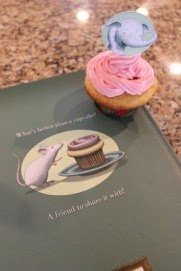 Thank you, little reading buddy, for inspiring this birthday celebration! Your suggestions made the whole family smile! Mike, it was great to meet you at the National Book Festival. Thank you for sharing your birthday with us. We hope you get the biggest, best, and yummiest cupcake for your birthday!